Gardeners are inherently curious. They make note of a plant label in a botanical garden and then go home to learn more. They pick up fallen blossoms to examine them closer. They spend hours reading plant catalogs. But they are often unable to accurately name or describe their discoveries. A Botanist’s Vocabulary gives gardeners and naturalists a better understanding of what they see and a way to categorize and organize the natural world in which they are so intimately involved. 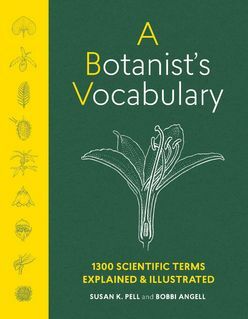 Through concise definitions and detailed black and white illustrations, it defines 1300 words commonly used by botanists, naturalists, and gardeners to describe plants. The terms include simple concepts like petal and sepal, some that apply only to a particular group of plants or to entire ecosystems, and others that are only visible under a microscope. The simple and accessible language and highly detailed black and white illustrations make this the perfect guide for anyone looking for a deeper appreciation of the wonderful world of plants. An up to date, concise, and accurate glossary of botanical terms frequently used by gardeners and nature enthusiasts.